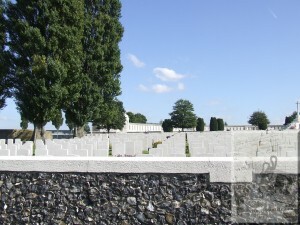 A Walk around Tyne Cot Cemetery - who is remembered? I recently visited Tyne Cott Common War Graves Commission Memorial to the Missing and cemetery as I needed to photograph four names on the vast memorial. It was a beautiful October day, the sun was shining, the sky was clear and a beautiful shade of blue. As I had driven for over an hour to get there I thought a quick walk around was in order, well you have to have a mooch around, don’t you? My camera batteries were playing up – even though they were fully charged, so I chose my headstones carefully as I moved through the rows. By now a group of army cadets had arrived, probably only a few years older than the school group, but with a totally different attitude to their visit. Among the vast number of Australian and New Zealand burials, there were quite a few Yorkshire Regiments but they will be saved for a later date. I tend to focus on certain regiments, unusual names, military awards or just something about a headstone that takes my fancy. For now, I am going to focus on one of the headstones found on my way back to the entrance. It was the unusual name of this young man that caught my eye – T E Dafter as is displayed on his headstone, served as Private 33513. 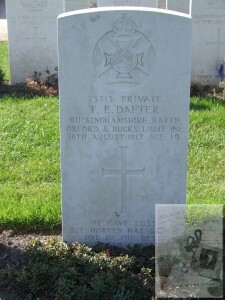 His headstone telling that he served in the Buckinghamshire Battn., Oxford ad Bucks Light Infantry. He was aged 19 when he died on the 16th of August 1917.
Who was T E Dafter? His medal card gives one snippet of detail, his first name – Thomas. Thomas had served in the Hampshire Regiment as Pte 32854 and as we know the Ox and Bucks as Pte 33513. Looks like I need to use both service numbers when looking for more information about Thomas. Let’s go back a few years. Thomas Edward was the son of Thomas Dafter and his wife Ealey Ann Dixon, who had married in the summer of 1894 in Chorley, Lancashire. Thomas Edward was born on the 18th of August 1897 and baptised a few months later, on 10th of October in Apley Lincolnshire. Thomas Snr. and his wife are in the 1901 census. There is an entry in the 1911 census that seems to fit our family – living at 90 Portland Street, Lincoln with Thomas Snr working as a labourer in a local foundry. Is this our family? Bringing our story back to August 1917. The 1/4th Ox and Bucks, a territorial battalion, by the 14th had been occupying a large part of the line and suffered a number of casualties, the counter-attack had been unsuccessful. At 2pm the battalion were relieved by the 1/1st Bucks Bn., and then moved to the trenches in the Albert-Bouzincourt line. The 15th brought bad weather making shelter very difficult to find. The 1/4th now relieved the 1/1st by the early afternoon of the 16th and shelling continued but not as heavy as in the previous days and several patrols were sent out. Enemy shelling increased in the morning of the 17th and by 9pm had increased according to the diaries ‘increased in intensity on Skyline and Ration Trenches‘. The diary continues ‘Between 9.45 p.m. and 10 p.m”. enemy movement on our left front was suspected, and at 10.15 p.m. suspicion of an actual attack increased. A barrage was asked for and immediately given. A patrol (under 2nd Lieut. Thompson) sent out subsequently found that the suspicious trench had been badly knocked about by the barrage, and had been abandoned by the enemy. Prisoners also stated that the enemy had intended to attack, but that our barrage had broken them up.’ Was it during this time that Thomas Edward Dafter lost his life along with one officer and 44 other ranks killed or wounded. 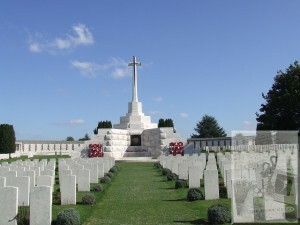 By the title of this blog, we know that Thomas rests in Tyne Cot Cemetery. We know from baptism and census records his parents names, but like most evidence where a transcription is involved names, places and dates can be entered wrongly. 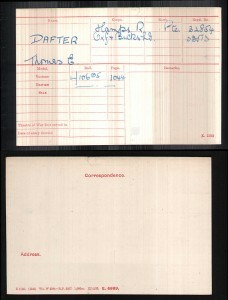 For example, the CWGC has information for T E Dafter including his name, rank, serial number and date of death – all correct, but the additional information is slightly misleading, as Mrs Amie Dafter of 90 Portland St. Lincoln is given, when we know from earlier that his mother was Early Ann Dafter nee Dixon. This information could have been obtained from a letter written by Mrs Dafter and her writing was not quit eligible or one military document for example, the Register of Soldier’s Effects, has a couple of additions to the original entry, two being the next of kin, where Early Ann, who was probably known as Annie, has her name entered as the sole beneficiary and could be transcribed as ‘Amie’ or ‘Amnie’. Thomas had enlisted after 1916 and was eligible for Victory and British Medals, known as ‘Mutt and Jeff’. Thomas is remembered on the St Andrews Parish Memorial on Portland Street, Lincoln as well as Lincoln Roll of Honour. St Andrews memorial was unveiled by Major H E Newsum in November 1920, due to the church being demolished the memorial was moved south end of Pelham Bridge. The base of Thomas’s headstone has a short inscription, probably chosen by his mother ‘ We have lost but heaven has gained one of the best the world contained‘. This entry was posted in General on November 8, 2016 by carol.